Another slow day on the river as we failed to land any fish. For the second consecutive day, we were left shaking our heads with our misfortune. Nonetheless we perservered and fished on. As the day progressed, Adam began fishing less and less. He became content with the comfortness of a mossy bed on the bank. During the last hour of light, I swung flies on my favorite stretch of the river. An olive sculpin was my weapon of choice and I swung it slow and fast and short and long. As we neared the truck and I continued to fish, Adam proclaimed, "that we had a better chance of seeing sasquatch". 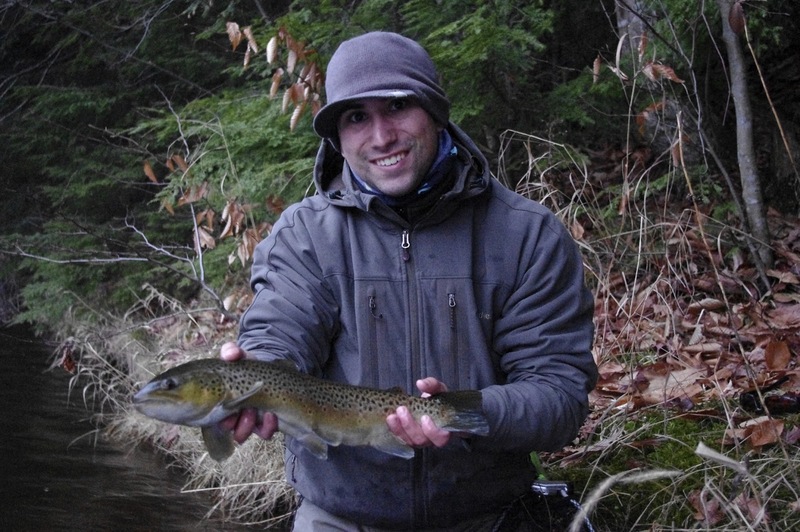 No more than a minute later, I hooked up with a brown as the sculpin slowly hanged in a soft spot off the bank. Things have a way of happening when you least expect them to. I anticipated catching a fish on every swing I made that day. For a brief few seconds after Adam questioned my resolve, I wasn't really thinking about anything. The pull and head shakes of the brown woke me up and I eagerly brought him to hand. We left the river with a walk off homer on the swing and began our long car ride home for the holiday season.